3:00 AM, Madison — In approximately four hours the polls will open for business and droves of Wisconsinites will descend upon their local libraries, churches, town halls and community centers to determine the fate of the state I have loved so dearly since I was a little boy. For nearly sixteen months, we have fought every waking hour to defend our state, its citizens and the values it has always held so dear, from the corporate take over that Scott Walker has so graciously opened the door to. We have shared, we have laughed, we have loved and we have cried. But most importantly, we have come together in ways I could have never conceived as being even remotely possible. I’ve lost friends and alienated many others, but this cause was and is too important to sit idly by and remain silent. For too long, the people of this nation have remained silent as those who would bring our country to the brink of socioeconomic disaster reaped unworldly benefits at the expense of the overwhelming majority of us. I never thought it could happen directly to Wisconsin, but in 2010 it did, it is happening and it will continue to happen unless we get out in record numbers and take a stand at the polls today letting the far right-wing extremists know that WE ARE WISCONSIN and we are not to be fucked with. From the spontaneity and unscripted passion of the inspirational protests in February 2011 to the rejuvenating and energizing rallies of battle-hardened vets well into the spring of 2012. From the original Capitol occupiers who refused to be intimidated into leaving Our House in the Uprising’s earliest days to the Solidarity Singers who refused to be intimidated into giving up their First Amendment rights to peacefully assemble and let their voices be so harmoniously heard on nearly every day. From the symbolic power of the Heart Balloon to the stoic grace of Lady Forward. From “Solidarity Forever” in the rotunda and “We Shall Overcome” encircling the Capitol to Pete Yarrow’s “If I Had a Hammer” during a late February snowfall and Tom Morello’s “This Land is Your Land” under a sunny, early June sky. From the newborn activists being arrested for the first time in the Capitol for civil disobedience, to the born-again activists finding their protesting lungs for the first time since the Vietnam War-era. From the countless hours spent collecting Recall signatures in the bleak Wisconsin winter when they said we couldn’t do it to the countless hours spent canvassing door-to-door to get out the vote in the blossoming Wisconsin summer because we simply had to do it. From Giles Goat Boy and Blue Cheddar to Monologues of Dissent and Cognitive Dissidence. From the powerfully radical visual of thousands of omnipresent Solidarity Fists simultaneously thrown into the air to the unabashedly childish joy of Democra-beeps continuously echoing around the Square. From Jennifer Schilling and Jess King to Tom Barrett and Mahlon Mitchell. From Recall Walker bumper stickers and Blue Fist buttons to Fox “News” palm trees and “out-of-state union thugs.” From the simplistic beauty and unmistakable messages on the signs of the Overpass Light Brigade to blunt humor and brilliantly creative messages on the homemade signs of hundreds of thousands of protestors. From John Nichols and Michael Moore to Lori Compas and Arthur Kohl-Riggs. 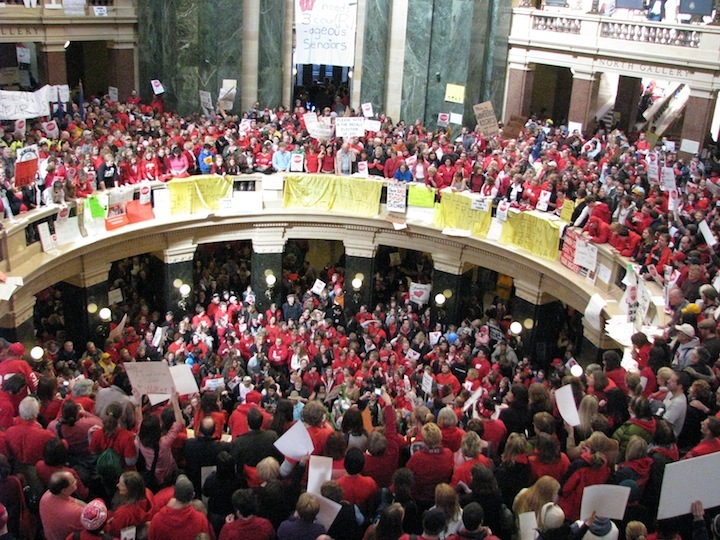 From the Wisconsin 14 to the Rotunda 6. From “David Koch” and “Divide and Conquer” to 200,000 on March 12th and 1,000,000 on January 17th. This is the Movement I love…I don’t know how this will turn out by the time this night is over, but regardless of how nervous we are about the result of the election and the future of our state, I know we’ll get through this the exact same way that we successfully arrived at this point: TOGETHER. Scott Walker may have torn our state asunder, but he has wrought a sleeping giant’s thunder. For those friends and family who I have known for decades, I appreciate all of the love and support you have provided me. For those who I have befriended and grown to love over the past 16 months, I appreciate that you so willingly welcomed me into your families with open arms. Although our work will not be finished and the Movement will continue on after today, this is our best hope to construct a barrier to the endless stream of social and corporate extremism flooding into our state. For now, let us stand tall and make the ground quake with our collective footsteps heading to the polls to vote Scott Walker and his fascist ideologies out of office. For eternity, let us hold our heads high and make those who would threaten our democracy quake with fear at the thought that they might once again dare to overreach and be faced with another Wisconsin Uprising. Let’s do this for our parents’ progressive past and let’s do this for our children’s enterprising future. Let’s do this for “Fighting Bob” La Follette and let’s do this for Bo Morrison. Let’s do this for Florida, Michigan and Ohio and let’s do this because the whole world is watching. Let’s do this…because Madison knows how to throw one hell of a party and I look forward to crying tears of joy on the Capitol lawn and dancing the night away on State Street. Let’s do this…because the arc of history bends towards justice and because June 5th, 2012 is our time to make that historical arc bend just a little bit more. Let’s do this…because WE ARE WISCONSIN. Solidarity, my fellow Wisconsin Winter Soldiers…forever FORWARD!!! Bravo for your words! Tears of solidarity and YES!!!! are in my eyes. For those who love to keep score, those who have good intent AND great strength of purpose undoubtedly are wracking up some kind of high energy “points”, to be discussed another time. Now we will stay focused on……..what is playing out today. A LOT of people are watching this. Every one of them is sending energy our way, one way or ‘t’other. STanding firm and in great gratitude……….for all that we are being catalyzed into learning……..real fast. EXCELLENT LETTER! WE WILL OUST WALKER IF WE ALL UNITE AND VOTE!!!!!!!!!! !